We'd like to clarify how games should be played on the league to avoid confusion. (Please note that this is the current version, modified in practice and takes priority over the original specification at this document). If something goes wrong please see here. All games are played even. Please try to stick to the colours as they are assigned WBW or BWB to boards 1 to 3 regardless of strengths. One player may have to click the button next to his name to get the colours right. These divisions may have handicap games where the player strengths are sufficiently different, otherwise they should be even as described above. Please try to stick to the colours as they are assigned WBW or BWB to boards 1 to 3 regardless of strengths (wherever this is possible). One player may have to click the button next to his name to get the colours right. Handicaps are assigned as the difference in rank minus 1 up to a maximum of 9. A handicap of 1 means no komi. If the difference in rank is less than 1, then the game is played as even with 7.5 komi and possibly with the weaker player as White. So for example if a 1K player plays a 10K player then a handicap of 8 is used and 0.5 komi. Or if a 2D player plays a 4K player then a handicap of 4 is used and 0.5 komi. 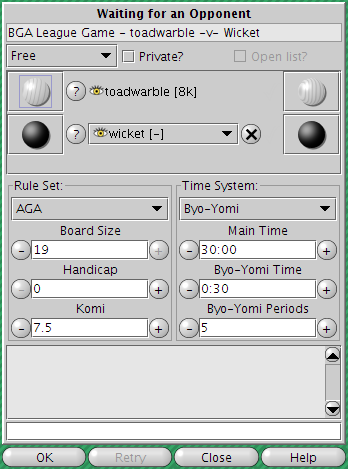 The komi on handicap games should be set to 0.5 except for handicaps beyond 9, as described below. If the handicap "would be" more than 9, then the white player gives 9 stones plus 10 points of reverse komi for each stone beyond 9. This might mean that the komi is -9.5, -19.5 etc. So for example if a 1K player plays a 20K player then a handicap of 9 plus -89.5 (reverse) komi is used. The software calculates the handicap "on the fly" from the currently-set ranks of the players. It is each player's responsibility to make sure that his/her rank is set correctly (each player can adjust his/her own rank). The players should be prepared to adjust the handicap before the start of the game if they know it is too much or too little to make the games as fair as possible. We suggest a "Free Game" as the KGS handicaps are ignored and in some cases wildly different strength players meet with non-standard handicaps and we don't think this should confuse KGS rankings. If you suddenly realise during the game you've got the game settings wrong you must continue with it if 6 or more moves have been played. If you have played less than 6 moves you may abandon the game and restart it. If there is an unavoidable interruption such as one player is disconnected or KGS crashes, please try to resume it as soon as possible or agree the result by one side resigning possibly in consultation with an agreed adjudicator. If it is impossible to resume the game and it appears very close, record the game as a draw (Jigo). (This is why a column has been provided for draws in the tables - and potentially a team match could be drawn also). If something goes wrong, please don't flounder. Please don't enter any results that may be trouble to unravel. Here's what to do. If you make a mistake setting up the game, such as getting the colours, handicap (if any), time limits or komi wrong and you notice the error, you should abandon the game and restart it if less than 6 moves have been made. If 6 or more moves have been made, then the settings must stand and the result reported as the server announces it. You must abandon the game, not have one side resign if the colours are wrong at the start, as if someone just resigns it may confuse the algorithm to load the SGF from KGS, and mistakenly load that one rather than the "real" one. This is another reason why games should be "free" so that abandoned games don't make the players get tagged as "escapers". Please be careful to correctly mark dead groups before pressing "done". If you can't agree about which groups are dead, play out the moves to prove it one way or another. This doesn't matter under AGA rules. If you get it wrong you cannot change the result from what the server announces. If you think that a handicap is wrong, because you are overgraded or your opponent undergraded, do not start the game or the outcome will be counted as the result. Query the matter immediately with your team captains or an administrator. A dispute may arise about people not turning up for games or some irregularity during a game. If this happens please contact an admin person or BGA council member as soon as possible as referee. The person chosen should not have any direct involvement with the match in question and should refuse to act as referee if he/she believes that there is any such involvement. To award the game to one side or the other. To declare the game to be a draw (Jigo). Note that this may cause the match itself to be drawn. To declare the game void and order its replay. The replay should normally be with the same colours, handicap or komi and time controls as the original game should have been (unless some of those were issues in dispute). In the last case, the referee may supplement his/her decision with a rider that a replay be made within a certain time or one of the other outcomes shall apply. If you think that the decision of the referee was wrong, or that the referee had an undeclared interest in the result, then you should appeal to the BGA council for a final decision. Games decided in this fashion (unless the referee decides that the result of the game should stand as it was) are entered as W+N or B+N or Jigo as appropriate and no SGF file should be included. The result must be entered exactly as reported by the server. We now let you correct incorrect colours, but please don't make a habit of this. If you realise you have made a major error in the reporting of a result, please stop entering anything else, but report the matter to an admin person for him/her to correct. For each match won, we give 100 points. For each match drawn (this can happen if some games were drawn), we give 25 points. For each match lost, we give 0 points. For each match played and completed, whatever the outcome, we give 0.01 points. The intention of this is to give most credit for matches completed and won. If those compare equal, we use the number of individual games won. However we try to give some credit to matches actually completed even if they are lost. Nevertheless, we would suggest that the league tables should not be taken too seriously in the early parts of the season. Towards the end of the season, we try to encourage teams to complete matches and may mark games as drawn or defaulted by one side as appropriate.